One time I hauled my former 1648 Lowe across some railroad tracks. Looking in the rear-view mirror, I could see the entire hull and motor bouncing a good foot or more high. I Had forgotten to strap the hull down. A transom saver would probably have jumped off completely. I now have transom straps that retract into the holders. I have added the spring to the transom saver. I think I will tow with more confidence from now on. Most people do, right up until something jumps up and bites them. Then they start to think about safety in a different way. But most of us are guilty of thinking it's gonna be the other guy, it's not gonna happen to me. I'm guilty of riding my motorcycle around town with no helmet, all the time thinking I'll be fine, I'm not going to have an accident right here in town. But it's always in the back of my mind that the odds of it being me are just as high as it is for it being someone else. But that's OK, we each have to "live or die" with our choices in this world and everyone's entitled to make their own choices. Riding a motorcycle without a helmet is way different than choosing between rather to run a transom saver or not. Rich, i would like to see more detailed pictures of your concoction! Different in some ways but similar in others. They are both designed to prevent damage, so they are similar in that they are both safety equipment. A few years back I was in the market for a 16-18 foot bass boat, powered by 90-150 hp. Couldn't afford new so I stuck in the used market. Amazed me how many cracked splash wells, cracking in the transom area (usually indicated by cracking on the gelcoat), cracks even over to the sides. Each and every one of them either used no transom saver, used the motors's built-in service lock (Yamaha has those, a little lever you flip down), or had some sort of wedge or block stuck between teh bracket and the motor. None of them used any sort of "transom saver". The older 4 stroke stuff-and it's weight-combined with poor road quality are pure torture on a transom. The newer stuff is getting a lot lighter. The lower unit is a heck of a lot tougher than the transom is. There are savers made with shock absorption already on the market. But what I don't understand is how they work with PT&T. The motor is still going to move a little, which puts pressure against the PT&T, which still puts a load on the transom. Maybe not as much? I'm no engineer obviously. Just thinking out loud here. I guess it woudn't be much of an issue if you have a manually tilted outboard. I also remember very well many moons ago when dad had a boat repair shop. Most of what we were doing was I/O stuff. Many of the pond hoppers had a hook on the transom that would support the outdrive while being trailered. And I remember many of those hooks being pulled out, cracked, broken, etc. 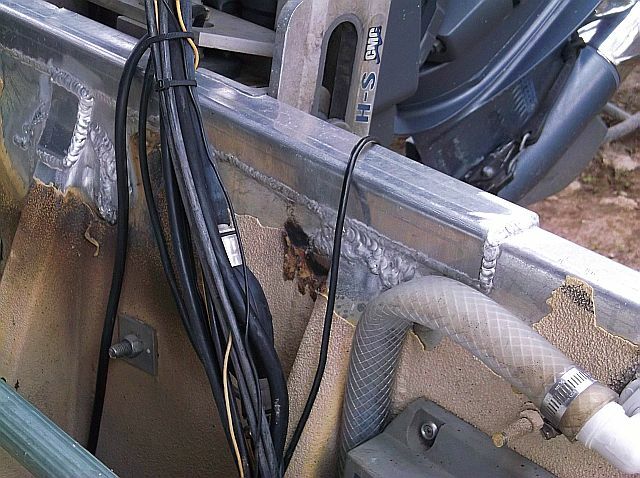 But those were a totally different setup than a transom saver....they were just a hook bolted through the hull, then sometimes a piece of chain or something that ran down to the top of the outdrive, so the weight of the outdrive would just "hang" on that hook once the hydraulic PT&T would leak down. 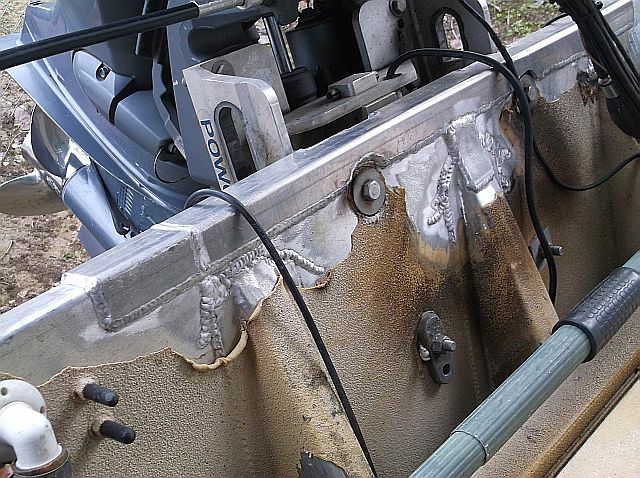 Any device that can keep a heavy engine from bouncing, swinging and moving around has to be better than letting that same engine tear the transom up. A device that has some shock absorption should be better than a stiff device, IMHO. That has to be the most concise explanation i've heard yet...and i totally agree. I wouldn't want it to be "springy" but it makes sense to me to have some kind of dampening on the transom saver. Going back to something Turbotodd alluded to earlier in this thread, does the group think a rigid (no shock absorption) transom saver would be better for a motor with power trim/tilt? I would think that everything should be as solid as possible, maybe a little absorption. 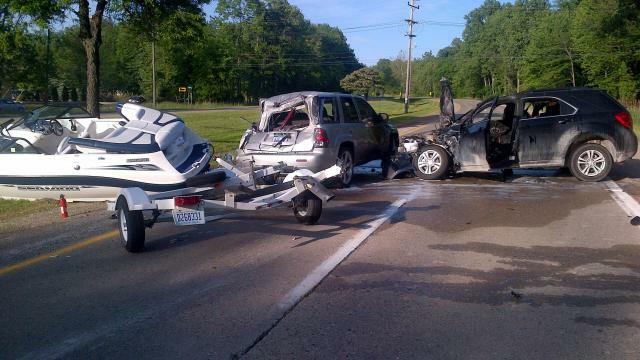 I would think if the boat is strapped to the trailer, and the lower unit is also connected to the trailer via a transom saver, everything should be moving as one piece, which is the wanted result. 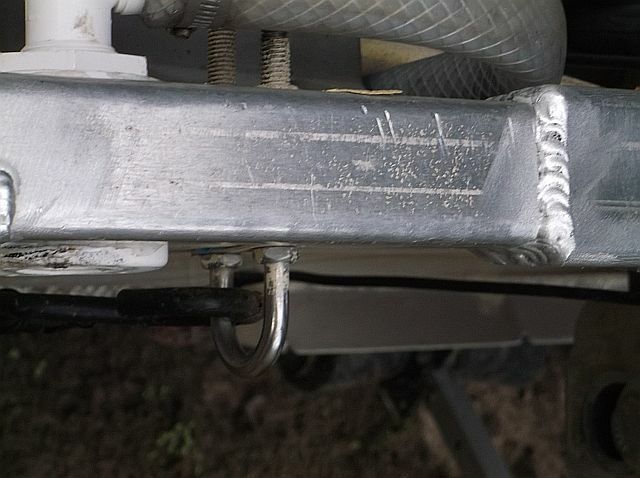 Wouldnt the rubber pad(s) on the end of the transom saver provide enough shock absorption when the other end is solidly attached to the trailer? Guess no one would know the answer to that question accurately. It would depend on the engine; its length; its weight; the construction of the transom; the height and roughness of the bump(s) in the road, and probably many other factors. I've had a transom saver on this boat since new, a 2005 22' Xpress tunnel hull Center console. The 115 Yamaha has over 1300 hours on it and it has been used in some less than desirable conditions. 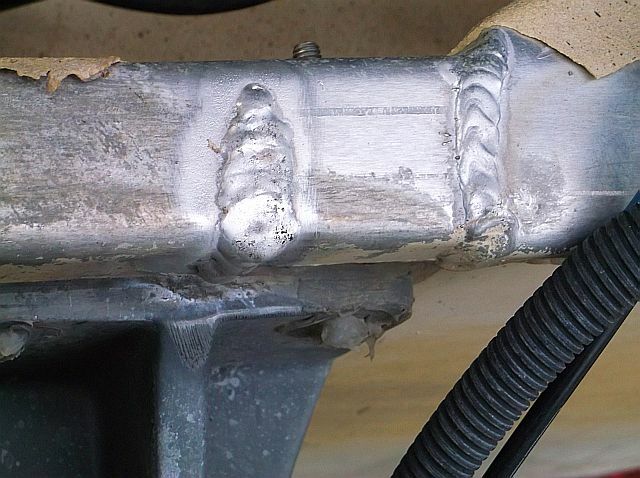 You have to weld em up, one of the maintenance problems of a tin boat. This may be a few more hours than the average fisherman put on a boat. The idea of a transom saver is that all the mass moves as one unit. The motor puts a strain on the transom because of leverage by the motor. 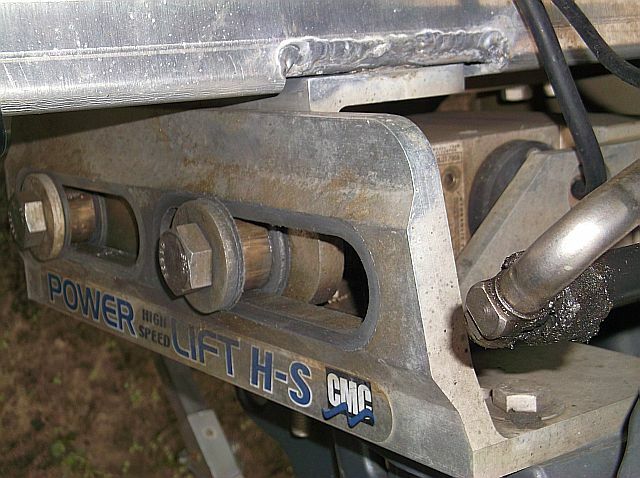 The transom saver reduces the leverage by attaching it to the trailer, no leverage, no flex at the transom. This is why wedges don't work; the motor still has leverage on the transom. Your design takes that static moment out of the design of the transom saver; by allowing the motor to flex it will add stress to the transom. A static arm is the only option to remove the stress caused by the motor as it moves. You design will work IF you also open the bypass valve on the trim/tilt unit. This would allow the motor to freely move independently of the transom, but the spring will act as a dampener to keep the motor in check. Otherwise, I believe it is a step backwards from the current, static, designs.